Testimonials - Qi Gong, Tai Chi and Ba Gua with Lewis Lee Regen. "Thank you for sharing your amazing gift of teaching with us this week at 1440. Your approach to Qi Gong is at once beautiful and approachable. I look forward to incorporating your teachings into my daily practice. I purchased your two DVDs... Thank you!."" "Thank you so much for your wisdom, presence and warmth. we enjoyed our time with you so much!" -Alaya V.
"Thank you so much for your Qi Gong class. I instantly feel good after Qi Gong and want to learn more. I hope to visit 1440 in near future and have this beautiful mind-body connection experience again. "Lewis has distilled the essence of ancient Taoist teachings. From his classes I've gained new perspectives on my health, well-being and vitality. I've learned simple techniques to cultivate more energy, and to become more aware of subtle energy. I love the vibration and standing meditations." Thank you! I previewed it last night and I totally connected to your energy and the love that you put into the video! You are glowing with happiness on film! Congratulations on finding your own style and thanks for sharing it with us. The Students Loved you! They spoke so Highly of you at the end of the day. You were one of the highlights of our entire workshop! Lewis is the best Qi Gong master I've ever met Worth your time. I assure you. his technique is so well translated And simply put for how deep it is it's amazing... even if u never tried Qi Gong yet. This is perfect for you. You'll like it. Your practice is so healing & very much needed! I've been talking to folks who have attended your class in previous years & they all say the same thing- how grateful they are to have learned from you & how much they wish you taught on campus more often. "Lewis' presence transcends worlds. With a vast array of massage techniques and energy styles to work with, Lewis gives my body and soul exactly what it needs to heal itself. After a session I feel grounded, at peace and reconnected to source. Recharged and ready to take on the world." I just wanted to say what a profound experience it was working with you the other day. I'm so glad that I had the opportunity to meet you. You were so present with me and with what was going on in my body/mind and spirit. It was truly a gift. I just wanted to let you know that I’ve had many massages that were excellent in my lifetime. (I feel fortunate to be able to say that)but I have never had a massage which affects of relaxation and alignment have lasted this long! WOW! I’m still in heaven and I cannot wait to see you again. 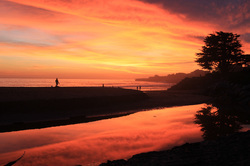 I only live in Santa Cruz in the Summer months of July and August but you better be sure I will be back by to see you. Congrats on all of your accomplishments and the joy that you continuously bring to people. I Feel Great!! That was such an amazing body treatment. Thank you for your powerful healing brilliance! !